Here is the official trailer for the movie and it…looks…amAzing! (The tone of “amAzing” is like really high-pitched on the second A of the word). This is a trailer for District 9. I haven’t heard much about this movie at all. I’m not sure why they haven’t marketed more, or maybe they have and I’m just in an ostrich hole or something, but how cool does it look? And SA peeps man! It’s also totally not what you’re expecting when you’re watching it. Awesomeness factor even more awesome. Suggestion: Have a watch yeah? From the guys that brought you Knocked Up, 40 Year Old Virgin etc etc. Since he’s in the country, I felt he needed a mention: Matt Damon. Great sense of humour, magic smile, a real guy’s guy and I think we can all agree after seeing the Bourne trilogy, as ripped as ever. Now he’s playing Francois Pienaar in the Rugby 95 movie that is currently being filmed and directed by Clint Eastwood here in SA. I’m particularily looking forward to everyone’s accents. Someone has taken a Hitler movie and dubbed the words, making it like he just heard Obama won the elections… it’s a cracker! There’s another one about Hitler’s car being stolen… worth a watch. So I was at the front where there’s water last night to see this movie that’s just been released in S.A. The movie is called Religulous and V & A Nouveau is the ONLY cinema showing it in the whole of Cape Town. The price of parking at the Vic and Al’s front is outrageous! Sweet Lord, you could put down a deposit for a small house in the South of France with what you pay for 3 hours of parking there. I mean, come on, I know it’s mainly a tourist destination but are they trying to shunt locals from there altogether? If this is the case, their plan is certainly working. The cost of the movies there are also suicidal. I bought two tickets and because it was half price Tuesday’s only had to pay R67.50. So are they trying to tell me that it’s R67.50 for one ticket any other day? Moses smell the roses that’s a lot of cash! Are they delusional? And you wonder why people buy pirated DVD’s. Lower your mofo prices Shopping Malls, Ster Kinekor, Nu Metro, or whoever is responsible for this ridiculous price hike! Oh, and speaking of pirating – How obnoxious is the advert we have to be subjected to before every single movie we watch? “You wouldn’t steal a handbag.” Oh, wouldn’t I? Who are you to tell me what I would or would not do? Maybe I have stolen handbag already (I haven’t) but you don’t know that! Anyways, I think that’s enough venting for one day, if you can, you really should check out Religulous if for no other reason than a good laugh. But go on half price Tuesdays with a group of people, so when you pay for parking you can split the bill! It’s been an interesting, jam-packed, memorable year (has it?) so I thought I’d dedicate the last month of it to all my favourite things that occurred, or which I feel have been noteworthy, during the course of 2008. 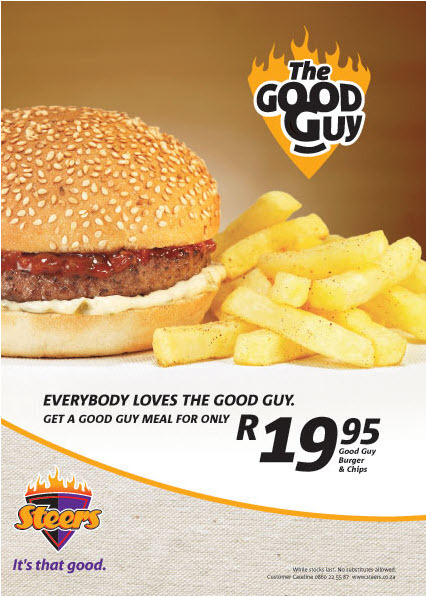 Ingenious of Steers; they came out with the R19.95 combo deal of basic burger and chips and we all came running. R19.95 – I mean it’s less than 2 beers and absolutely the ideal 03:00am munchies meal. And oh how I love 24hr Steers locations. So first things first, I trust everyone watched the 42-6 obliteration that was the South Africa vs. England rugby game on Saturday; Victory and gloating at its finest. Just after Habana scored his try at the end of the game, did anyone else see the boks… do “the scissors?” And do you think this has any relation to the Afrikaans, teen classic movie, Bakgat? OK, I might be using the term “classic” a little loosely here but I’ve seen the movie and what Habana and Burger, among others, were doing to celebrate, was the “sker” from Bakgat. For those of you who haven’t seen the movie (and I’m not even joking, I recommend you give it a watch) the two standard geeky/horny/socially inept characters have this joke between each other that whenever something cool happens they “sker” each other in order to acknowledge it. It’s by far the funniest thing in the movie, along with some other pearler one liners. So, my question still stands: Did the Springboks watch Bakgat and if so, when? Was it one of the movie selections on the plane going over to the UK? Did they all go to Peter De Villiers’ hotel room one evening and watch it as a team building exercise? Was there popcorn and Milo involved? And whose idea was it? Were there other DVD’s they decided to watch and if so which ones? Was Braveheart one of them? Diehard 4.0? Maybe a RomCom, like Knocked Up, you know, to lighten the mood? *This is another Bakgat reference and will only be amusing to the minority who have actually seen it… apologies to everyone else.